While Mark Sanchez was completely blowing the game for the Jets last night, someone on Twitter brought up the fact that his girlfriend had gone to high school with Sanchez. 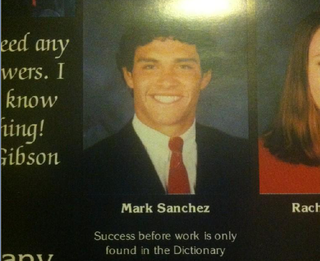 With access to his girlfriend's yearbook, he decided to share some high school pictures of Sanchez. What an original senior quote! "Success before work only comes in the Dictionary." Not sure why "Dictionary" is capitalized. Dang committee proofreaders. Yes, Mark Sanchez, you're a "meat head," the same way that being the starter of the Jets makes you a "quarterback." That Rebecca Resnick is one lucky gal. After he made poor dancing decisions, though—really, trying to grind during a slow song?—the school announced a new prom king.